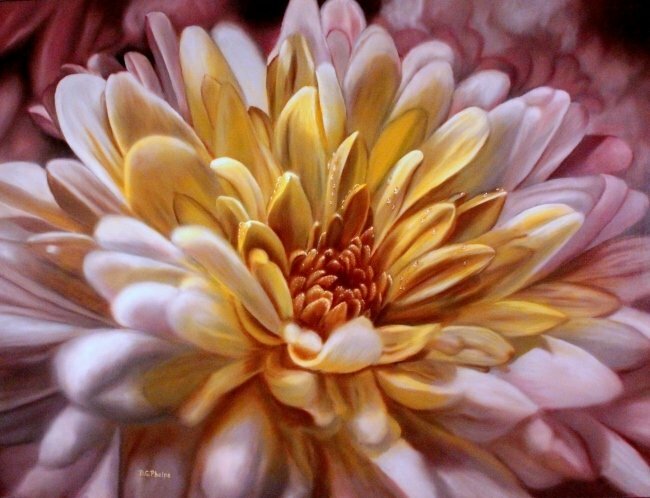 A Modern Chrysanthemum Flower Painting, a very closeup veiw of the blossom. 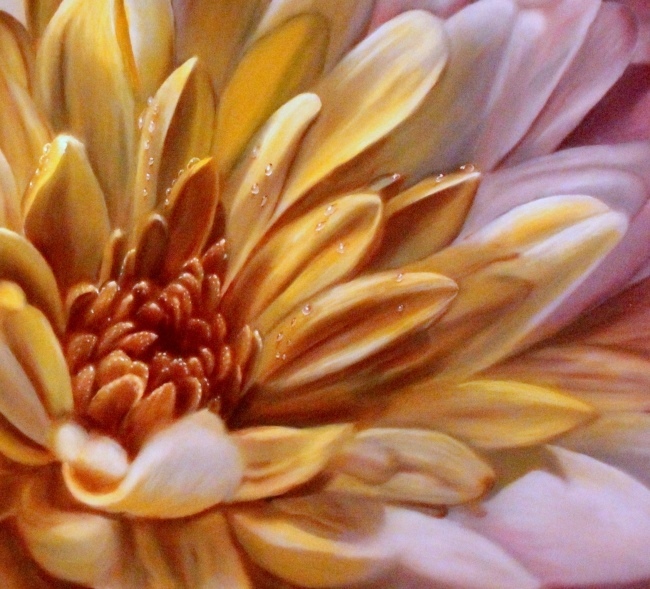 A Modern Chrysanthemum Flower Painting, a very close up view. In this chrysanthemum painting, you can see right into the flower blossom. My Chrysanthemum here is from a series of three done from a single chrysanthemum plant in the front yard! This is the only one on a 30" x 40" gallery wrapped canvas. The others are on panels. This particular view reminded me of our many fireworks displays thus the naming. There was just a touch of dew/frost on the petals that morning when the reference material was taken. It was a glorious display of nature. There is a great trick I used in the foreground to bring the most forward petals out of focus and draw your attention back into the center of the blossom, where all the action is. Enjoy the celebration! I sure have. 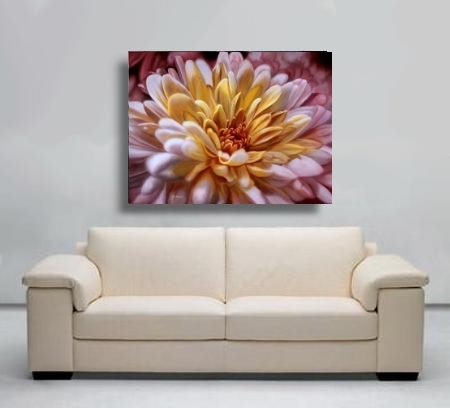 This modern chrysanthemum flower painting is an oil painting on 30" x 40" gallery wrapped canvas. If you are really interested in purchasing this work, please inquire on the link here. A bit more about this very useful flower. The chrysanthemum, often known as mums and chrysanths, is a perennial flower. (It comes back year and year). It's really a very old plant! Cultivated in China as early as 15th Century BC, as a flowering herb. In Chinese art, its one of the Four Gentlemen. (Or Four Noble Ones), the orchid, bamboo, plum blossom, and chrysanthemum. Look up some old Chinese watercolor paintings, and you're likely to find these within them as subject matter. The chrysanthemum is used in tea, and cooked up as greens. I don't know if I'll try that, because I know too that it is where we get a popular natural insecticide (pyrethrins). I'm sure they are from different varieties, the tea kind, the eating kind, and the bug killin kind. I'm mostly interested in the flowering kind with all the variety in colors. It's nothing like visiting a large garden center in the fall when they have large groupings of these beauties on display. So, would you like to add a bit of a fall garden to your walls? Click here to see to get the details at my Etsy store. Click here to go from the modern chrysanthemum flower painting to my online gallery page.